Christopher Caile demonstrating a karate technique on Ash Roeca during Seido Karate’s annual beach training (2005). The training is held the first weekend of August every year on a beach near New York City. For black belts the day begins at 5 am with sunrise meditation. Editor's Note by Christopher Caile: This is Part 2 of an article on Christopher Caile that appeared in the September 2009 issue of the Finnish martial arts magazine ”Budoka.” It appears here in two parts because of its length. Part 1 included an introduction, Caile’s beginning in the martial arts, his introduction of karate into Finland, his trip to and study of Kyokushinkai karate in Japan, his return home and his relationship with Tadashi Nakamura, founder of Seido Karate. This naturally led to research on kata and the meaning of their movements (applications) as well as their principles and strategies. He is interested in how old kata has changed over time with different teachers and within various styles. To help in his research into the early roots of karate, Caile became familiar with many different styles of Kung Fu. He also delved into boxing and mixed martial arts including living and practicing with an Ultimate Fighter. Later after starting www.FightingArts.com, he was invited to seminars and to train with many of teachers and styles of Kung Fu and karate. “This greatly expanded my knowledge,” Caile noted. Strength, speed and power in most Japanese karate styles are generated differently from some old Okinawan Shorin-ryu styles, which differ again from how many Japanese Koryo (old Samurai) arts generated power, or how Kung Fu styles, such as White Eyebrow and Wing Chun, do the same. And what Miyagi taught in his Goju Ryu Karate evolved away from the body dynamics his teacher Higaonna taught, dynamics still taught in T’oon Ryu (which continues Higaonna tradition). Traditional karate kata in most styles, however, even basics, contain many of the old Okinawan body dynamics, but much of this has largely been unrecognized within modern karate. As my friend Richard Kim used to say: ‘The secret to all martial arts is to see what you see,’ but most don’t see what is before them. This is not to say that some karate masters don’t use some of the old body dynamics, but if they do, they mostly do so almost unconsciously, like his teacher Tadashi Nakamura. “But if you learn to really see what is before you in your kata and basics, you can teach yourself a lot,” says Caile. In addition to his karate, Christopher Caile has practiced Wadokai Aikido (Suenaka-ha Tetsugaku-ho Aikido) for over twenty years. He began in Buffalo under Shihan Mike Hawley and then when he moved to New York he has studied directly with the style’s founder, Roy Suenaka, 8th dan. Suenaka also teaches Matsumura Seito Hakutsuru Shorin-ryu Karate-do and Kobudo, often referred to as “White Crane Karate.” Suenaka studied with the famous Okinawan karate master Hohan Soken during his tour of military service on Okinawa. 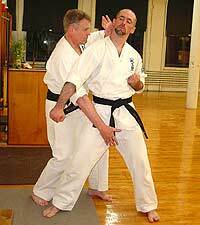 Caile emphasizes that he is not a student of sensei Suenaka in karate, but has learned a lot of Hohan Soken’s tuite-skills (the Okinawan art of grabbing, seizing and controlling) and close combat from his aikido teacher. Christopher Caile demonstrates a self-defense technique against an outside knife cut executed by Sensei Jeff Evenson, a self-defense technique taken directly from the karate kata Pinan four. 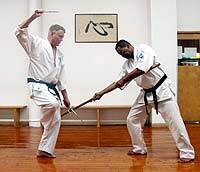 Training in kobudo at Seido Karate’s headquarters in New York City, Christopher Caile uses his sai to block a bo attack launched by Shihan William Best. In his professional life Christopher Caile has founded several businesses in different fields. In Buffalo he started a private telephone company and then a portable pontoon boat company based on his own innovative design. Later he formed an electronics company based on a new digital telephone technology he helped design and patient. Created was a new class of small business telephone systems that worked without needing costly central controllers. The technology was sold to Bell South. Later as a newspaper journalist and photographer, Caile reported on local politics in the Buffalo area. He also wrote for the Holistic Health Journal magazine and contributed chapters in Health Inform’s (1997 & ’98) annual books, “Resource Guide to Alternative Health” on the subject of Qigong (Chi Kung). Ten years ago he founded www. FightingArts.com, a website to teach about and share information on martial arts and combat styles. “FightingArts.com is dedicated to traditional martial arts.” Its home page is a web-magazine that features articles, news and columns. The site also has an extensive library with over a thousand articles on various martial arts and topics, active forums for discussion and an extensive E-store where readers can purchase books, DVD’s, artwork and martial arts equipment. 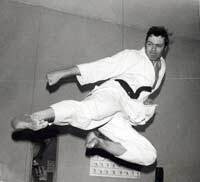 Christopher Caile demonstrates a jumping side-kick at the State University of New York at Buffalo, just after he started to teach Seido Karate at the university in 1979. 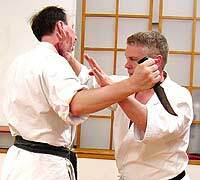 Christopher Caile demonstrates a double-palm-strike to Seido student Ed Frawley. This technique is often preceded by round mawashi-uke-technique characteristic to the kata of Goju-ryu and Naha-te. In this application the initial block turns the opponent’s body sideways setting him up for the double palm strike shown here. Caile ocassionaly visits Japan and Okinawa to attend events sponsored by his Seido Karate organization. During these trips he also meets with his qigong (a form of Traditional Chinese Medicine) master, Dr. Zaiwen Shen. He also trains and conducts research on various martial arts and interviews martial arts masters such as Okabayashi Sensei of Hakuho-ryu Aiki Budo. On Okinawa he trained with Eiichi Miyazato (Goju-ryu Jundokan) and Hanshi Fusei Kise (Matsumura Shorin-ryu Karate) a student of Hohan Soken. As Editor of his Website, Caile’s job is to know, attend seminars by and write about various martial arts and their teachers. In this capacity he has trained with the Okinawan Sensei Katsuhiko Shinsato, head of Kishaba Juku, a group that teaches old Shorin ryu body mechanics and use of the koshi. The group’s founder was formerly a member of Matsubayashi-ryu and student under Shoshin Nagamine founder of that style. With his aikido teacher Roy Suenaka, Caile visited the Aikikai Honbu in Tokyo and met and worked out with the son and grandson of Morihei Ueshiba (founder of Aikido), Kishomaru who at the time was Doshu (a hereditary title denoting head of the Aikikai organization), as well as Moriteru (grandson). During that same trip they also practiced at the Tokyo aikido dojo of Kenji Shimizu (Tendo-ryu) and in Iwama in the dojo of Morihiro Saito. In Qigong, Dr. Shen has been Caile´s teacher for nearly 20 years. Initially Caile traveled back and forth to Toronto from Buffalo, NY, for his studies. Later when Dr. Shen moved to Japan, Caile visited him there. Dr. Shen currently runs Shen’s College of Health Medicine in Nagoya. He is also a Professor Emeritus at Chukyo Women’s University, where he taught Chinese Medicine and hygienics and conducted research in qigong. Caile also practices Zen. “I was introduced to Buddhism and mediation on my way to Japan,” says Caile. “For a short while I live in a remote jungle Buddhist monastery while traveling up the southern panhandle of Thailand. In the afternoon I helped out by washing elephants in a jungle river using a long broom. The only instruction I was given was, “Get out of the way if the elephant tries to lie down.” Years later in Buffalo Caile joined a Zen mediation group and within Seido Karate helped organize camps held in the Catskills (north of New York City) at the Doshinji Zen Monastery (Zen Mountain Monastery). “Soon on weekends I began to visit the monastery on a regular basis,” says Caile. On FightingArts.com I have written a few article on how Zen mediation can help in free fighting. 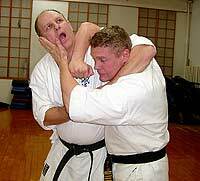 Christopher Caile demonstrates a self-defense technique against neck-lock attempt by his fellow Seido student Gregory Seel. The technique is performed in two parts and originates from the kata Seienchin. When developing his self-defense curriculum taught at the State University of New York in Buffalo, Caile discovered that the normal defense he practiced did not always work against a stronger, determined opponent. So Caile went back to the kata and then recognized that a preliminary move was the key (the one shown here) to setting up the technique. As the attacker tries to apply the head lock, the defender hits upward into the attacker’s jaw with his left palm (hitting a nerves running under the jaw bone) while his right forearm strikes into the side of the neck hitting another critical bundle of nerves called the brachial plexus (that control the arms) as well as the carotid sinus that helps regulate blood pressure. The technique causes a neurological overload to the brain combined with a sharp drop in blood pressure, the combined effect causing a momentary black out or unconsciousness. Two Finnish pioneers of karate, Jussi Ikonen striking with nihon-nukite towards Kyösti Korpiola’s eyes. Mr. Korpiola was the first karateka in Finland to take part in a grading by Christopher Caile in 1960. The photo was published at the beginning of the 1960s in a Finnish magazine called Viikko-lehti (Weekly-magazine).